Disclaimer: We received the product described in this blog post, free of charge, for the purpose of writing our honest opinion about it. Nonetheless, all opinions are 100% our own. All images and content of this blog post are protected by copyrights. You ma not use any of this information without our written consent. Please be advised that what may work for my family, may not necessarily work for yours, so we encourage you to read more reviews, to make a better informed decision about any particular product. Our early formation in life, comes from the things that influence us as children. Between the values we learn from our family and the situations that surrounded us as we were growing up, there are things that remain in our hearts forever. In my opinion, many of those things, are the stories we grow up with. This is why, I did not hesitate to the invitation of reviewing one of 'i See Me!' Books' newest products "My Little Lovebug and Love Notes Gift Set". Not only did I received the item I've just described for the purpose of this review, but 'i See Me!' books was kind enough to sponsor a giveaway in which one lucky follower of Just Happiling, will receive their very own personalized "My Little Lovebug and Love Notes Gift Set" as well. That's super exciting news, considering that Valentine's Day is right around the corner. In case you are not familiar with 'i See Me!' Books, this is a company that specializes in personalized books for children, in which the characters can be adapted to have certain characteristics to look similar to the child the book is intended to, and in some cases, like in this new book, you can even add their picture to make it even more personalized, thus making this a unique gift for a very special little one. Please keep on reading to find out what I thought about this book, and your chance to win. I feel that in an era where we do a lot of online shopping, it is very important to share in my review, the conditions in which this product was packed for shipping. I believe this is an important aspect to discuss, because sometimes the products we order are gifts, and will be arriving to someone else's home. It feels horrible to expect a call with a “Thank You, I love my gift”, and instead get a “Hmm, it arrived broken/damaged” in a very disappointing tone. I really appreciated that both the book and love notes were carefully placed between thick bubble wrap, thus protecting the product pretty well. Then it was packed in a box that was big enough to handle the thickness of the bubble wrapped product, and hardy enough to withstand my postman's favorite delivery method; tossing. It is always nerve-wrecking when I hear my packages being tossed from the gate to wherever the postman feels appropriate. Nonetheless, when I know my packages are as well packed as this gift set was, it does give me some peace of mind. I was really happy to see that this gift set arrived in perfect conditions. Although shipping times vary depending on the distance the package has to travel, I got this package within a week from when it was shipped. In my world, considering that I live in the remote corners of the Southwest, this was fast shipping. The storybook in the 'My Little Lovebug & Love Notes' gift set, comes only in hardcover. In my opinion, this is very practical because hardcovers contribute to a longer life in books. Especially when the book is going to be handled by younger kids, which in either case, just happens to be my preferred choice for all our special books. However, if your personal preference is softcover, you can choose this option when you buy the book by itself, and not as a gift set. In my case, I drop books like there is no tomorrow, and those that are softcover, tend to fold alongside some pages, and they always end up with ugly bent marks. Well, I am glad to know that this is never going to happen to this lovely book, thanks to the hardcover feature, and mostly because this is a gift for my cousin and her daughter. When my niece grows up, I truly want her to be able to go back and show this to kids of her own. Dedications are what makes gifts like this one such a unique treat. It was delightful to see that part of the 'i See Me!' personalized experience, goes beyond just images, by allowing you to write messages in certain products, just as shown in the image below. Here, my cousin was able to include a beautiful message, for her daughter to read every time she opens the book. I must add that this book can be personalized with up to two recipients and up to two senders. So this book could come from both parents, grandparents, aunts and uncles, and have one to two kids as the characters of the story. I have to say that I really enjoyed the quality of the graphics and thematic used. This is a very colorful storybook, which makes it ideal for little ones. I think those are the books I remember the most from my childhood. I really appreciated the style used for the characters and the background images. I felt the well balance of color combinations, were very appealing to the eye, and it totally made me fall in love with how it turned out once the photos were added to the characters. I think that the use of a large font size is also ideal for the little ones, because it becomes less overwhelming when trying to read it themselves. Plus it makes it fun when you have all these different font combinations. In my opinion, the printing quality was excellent, and I really liked the slightly glossy finish of the pages. It really gives it a professional finish, rather than something one could attempt to print at home. A few years ago, my family got into the habit of saying 'I love you', hugging, and kissing all the time; like literally ALL the time. So we really adore anything that helps us encourage that habit, to spread it further than just our family, but also to close friends and family. That is why, I thought that adding these personalized Love Notes and make it part of a gift set, was brilliant. Considering that Valentine's Day is on the way, it makes it an ideal gift for your little ones. To be honest, when you are a kid, the biggest love you know is that which comes from your parents and close relatives. That is why my mother always celebrated Valentine's by showing us how much she loved us and always got us special V'day cards. It was a big thing for her to share with both my brother and me. And quite frankly, that is why I still have some of those gifts back home, because they are family treasures. The quality of the graphics printed in the fourteen 4 x 6 'Love Notes', is as good as in the book, although the thickness of the material used is thicker with them. I think they might be as thick as with average card-stock, feature that I really liked. The 'Love Notes' follow the same graphic theme as the book, making this a wonderful set to have all together. The back of them is blank, which makes it ideal so that you can further personalize them writing something special for your kids. Maybe a story, and who knows, you can even ask the rest of your family members to write something to your little ones in each of the cards. That way, your kids get even more messages from everyone who loves them. Now that is a great idea! Another great idea, suggested at the gift set website at 'i See Me!' Books, is to hide the 'Love Notes' all around the house. This way it becomes a wonderful treasure hunt game, which I believe will end up being a very fun family event. Games like such, are always a grand way to bring the family together and create memories. I know my cousin and her daughter are going to love these 'Love Notes'. They are fun, colorful, and have very creative ways to say “I love you”. I can already hear my niece giggling to each an every one of these messages. This gift set is totally going to make her Valentine's Day extra special, and the best part is that she will see both Mommy and herself, as part of this lovely personalized book. In every review, I try to add a small paragraph with areas for improvement, but it was a very joyful surprise to see that this product has none that I can detect. The quality is great, the use of graphics was fantastic, I honestly loved it so much that it got me all excited about seeing my niece's face when she sees herself in yet another story filled with so many enjoyable written sentiments. All I can say is that this book is so delightful to browse, that I can't wait to have kids of my own to get them their very own 'My Little Lovebug' personalized experience. If you want to learn more about the beautifully created line of personalized books and gift sets that 'i See Me!' Personalized Children's Books has available, visit their website; www.iseeme.com. Don't forget to subscribe to their newsletter to catch the latest news about new products and special promos. Valentine's Day is coming, and a little birdie told me that there might be an awesome promo coming soon. So stay tuned or follow us via social media to find out about this event. Keep in mind that if you buy the “My Little Lovebug” personalized storybook by itself, by default, you'll find it in softcover and then you'll be able to choose between this or hardcover. 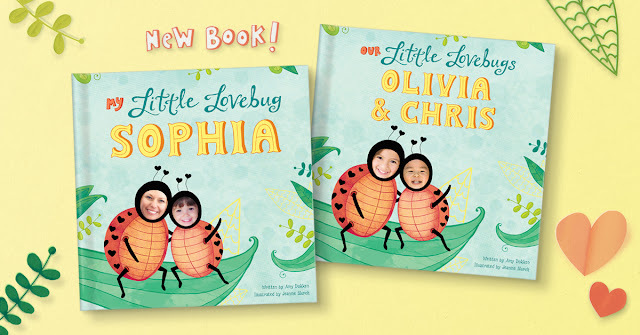 However, if you opt for purchasing the “My Little Lovebug and Love Notes Gift Set”, you'll find that the storybook will only be available as a hardcover book. 'i See Me!' Personalized Children's Books was kind enough to sponsor a giveaway so that one of our lucky followers could celebrate their little ones during this loving month. 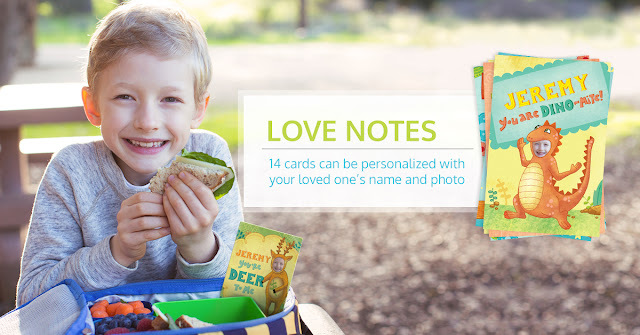 Want a chance to win a personalized "My Little Lovebug and Love Notes Gift Set" of your own? Then don't forget to follow the link below and share with your family and friends too. Remember that sharing is caring. This giveaway is open only to US residents, who are 18+ years old at the time of entry. Find all the terms and conditions of the giveaway at the giveaway post, link below. Giveaway starts on February 1st, and ends on February 15th, 2018 at 11:59 pm PST. Winner will be chosen on February 16th, and will only have 24 hours to claim the prize. Good Luck! I've been daydreaming through the I SEE ME website wishing for almost everything they create, ever since I found out we were expecting our 1st grandchild. Now that our little grandson will be turning 1 in March, I only want to get him one or more of their creations even more! This one you reviewed would be adorable with Ashton and his Mama's faces in it. That little boy beyond ADORES his Mama and she is his best friend too so he would love having both of them in the book that way. I'm excited you have a giveaway, as I'm grateful to even have a chance. These are so cute. The illustrations are nice, and I love the personalization. The My Little Lovebug and Love Notes Gift Set is cute, and would be a perfect gift for my niece for her birthday. I love personalized books, especially for kids.